A food web is a system of interlocking and interdependent food chains. In each food web there are several trophic levels. The trophic level of an organism is the position it occupies in the food chain. These trophic levels include: primary producers, primary consumers, secondary consumers and tertiary consumers. 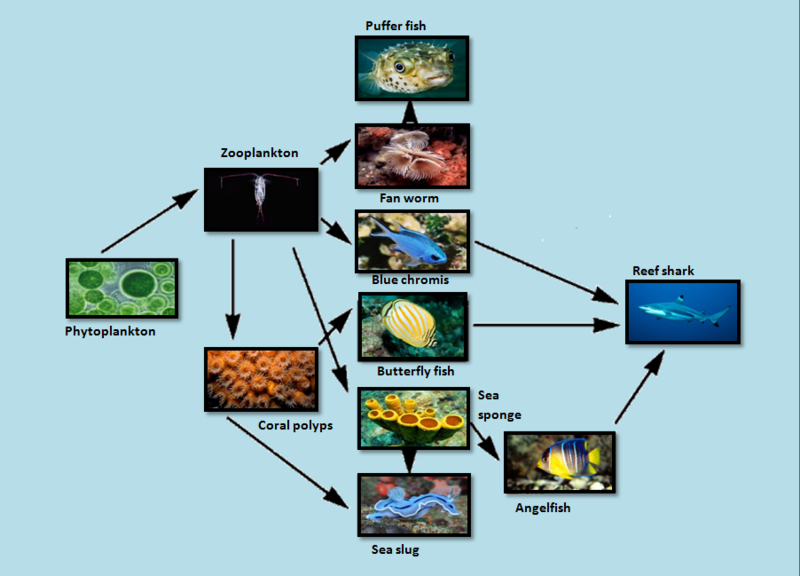 The food webs are a very important factor in the safeguard of the coral reef ecosystem... Food webs protect the fragile balance there is between species; there are just the right amount of predators and prey within the aforementioned trophic levels. We start to see the importance of the balance set by the food webs when we see the consequences of anthropological interferences in those food webs. For example, because of overfishing, there might be too little tertiary consumers which would cause there to be more secondary consumers (less would get eaten). Then, because of the increase in the number of secondary consumers, there would be less primary consumers (they would all get eaten). And, then there would be too many primary producers (they would not get eaten). As shown in this simple example, the balance set by the food web is very fragile, yet important and a simple interference can offset the entire system. First of all, the arrows indicate what is being eaten by what. The organism at the head of the arrow eats the organism at the other end of the arrow. This particular food web starts with Phytoplankton, a photosynthetic primary producer that receives its energy from the sun and does not need to consume any organism. The Phytoplankton is consumed by Zooplankton, a primary consumer. The Zooplankton is then consumed by some secondary consumers: the Fan Worm, the Blue Chromis, the Sea Sponge the Coral Polyps. The Fan Worm is eaten by the tertiary consumer, the puffer fish. The Coral Polyps are eaten by a tertiary consumer, the Sea Slug. The Sea Sponge is eaten by the angelfish. Finally, the Angelfish, the Blue Chromis and the Butterfly Fish are all consumed by the tertiary consumer, the reef shark.